This award-winning mixed-income apartment community resulted from an innovative public-private partnership between Home Forward and Gerding Edlen Development. Located next to Jeld-Wen Field, The Morrison is part of a mixed-use development that was completed in 2007, replacing a 1940s building that was well past its useful life. 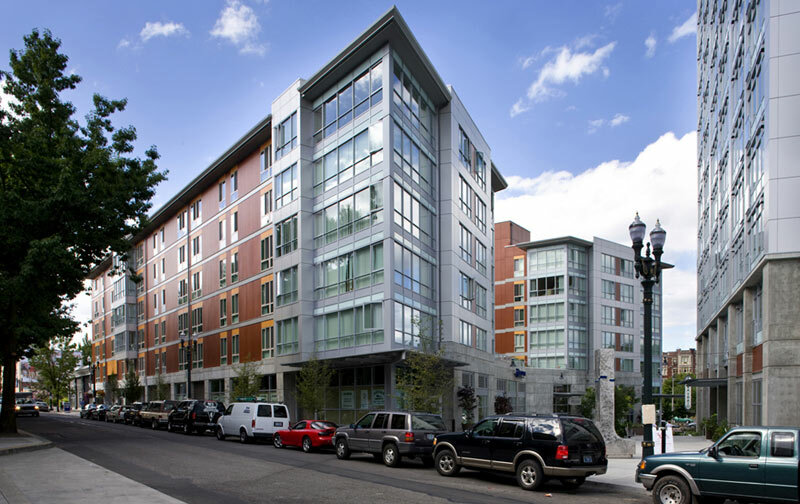 The site also includes 261 market-rate condominiums, extensive ground-floor retail space, underground parking, and a central pedestrian plaza featuring public art created by renowned Oregon sculptor Lee Kelly. Sustainability features include a prime downtown location as a transit-oriented development; LEED Gold certification; bioswale gardens and eco-roof to treat storm water; and water-efficient fixtures. Regional Arts and Culture Council’s “per cent for art program” assisted with coordination of public art installations at each end of Howard’s Way by Oregon sculptor Lee Kelly. 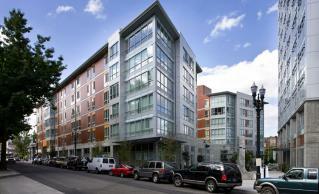 Public-private partnership created unique opportunity for immediately adjacent mix of incomes, ranging from no income individuals at The Morrison to upper income condo owners at The Civic.